With an important emphasis on Government initiatives as to Urban Development – Pradhan Mantri Awas Yojana (Urban); Atal Mission for Rejuvenation of Urban Transformation (AMRUT); and the Smart Cities Mission, the Prime Minister, Narendra Modi in an event on “Transforming Urban Landscape” in Lucknow assured projects worth Rs 7,000 crore of Smart City Mission have been completed. On his visit to an exhibition on Flagship Missions of Urban Development, he interacted with 35 beneficiaries of PMAY (U) — one from each state/UT. Under the Flagship Missions, he also laid the Foundation Stone for various projects in the State of Uttar Pradesh. 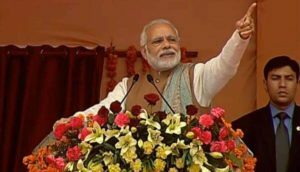 While addressing the gathering, the Prime Minister averred that urban administrators at the gathering, are representatives of the cities that symbolize the hopes and aspirations of New India, and the new generation. The Prime Minister said with the completion of projects worth Rs 7,000 crore and rest under implementation, we aim to provide the lower, lower middle and middle class with the better civic amenities to make their lives better. Also, the Integrated Command Centres are the important part of this mission and they have begun functioning in 11 cities where work is underway. The Prime Minister also stated that the Smart City Mission inspires civic participation, civic aspiration and civic responsibilities. Also, smart, secure, sustainable and transparent systems are transforming lives of millions via this.